“Film is one way — perhaps the most important way — in which India makes sense of the teeming, heaving and chaotic multiplicity and the sprawling diversity of this tumultuous nation state. at the village where Gabbar Singh prowls. Two good guys, two girls, one bad guy. Song — bang — song — bang. not Veeru and not Jai. I finally see what the fuss was about. 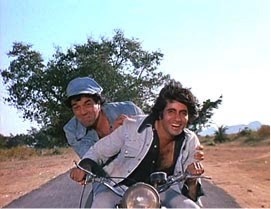 Or at least I think I do — Sholay is a love-story; Sholay is a thriller; Sholay is a tragedy; Sholay is a comedy. 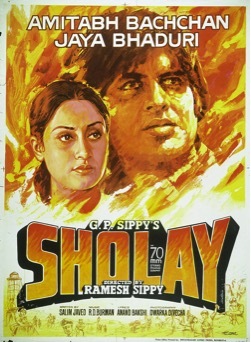 Sholay occupies a unique place in the Bollywood imagination for spurring the whole genre of “masala” films and the reason it retains its appeal to this day is because it still strikes us as contemporary. 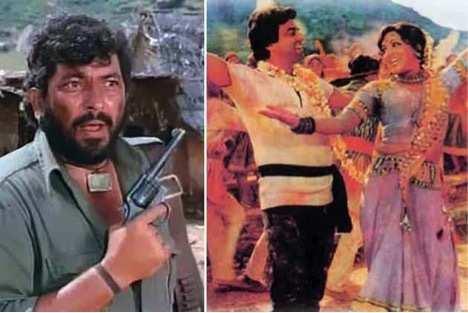 The aesthetic that worked so successfully in Sholay continues to inspire modern-day films: these two movie posters are separated by 37 years. 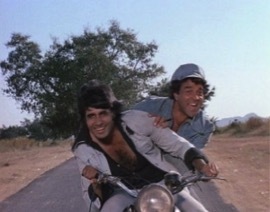 Above all, Sholay is a riddle. The plotline twists and turns; it delights one moment and frightens the next. 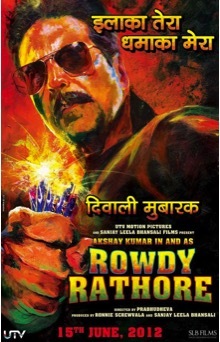 Like much of Bollywood, the fun lies not in deciphering the riddle but in puzzling over it, in going along for the ride. The question is not whether the boy gets the girl — because of course he does — or whether or not the bad guy loses — because of course he does — but how does the boy get the girl? How does the bad guy lose? It’s not everyone’s cup of tea, because it’s not an ordinary cup of tea. It’s masala tea.